Model 36 was the first chair designed by Bruno Mathsson purely for relaxation. that it is still in production today is testamant to the far sighted understanding of the mechanics of sitting of the designer. In 1936 at the Röhsska Museum Bruno Mathsson exhibited the results of his experiments into developing three basic chair types using laminated beech frames to support woven hemp webbing – Work Chair, Easy Chair and Lounge Chair Model 36.
influence on the innovative role of Bruno Mathsson in 20th Century furniture design. In particular Mathsson began to study the mechanics or ergonomics of sitting. 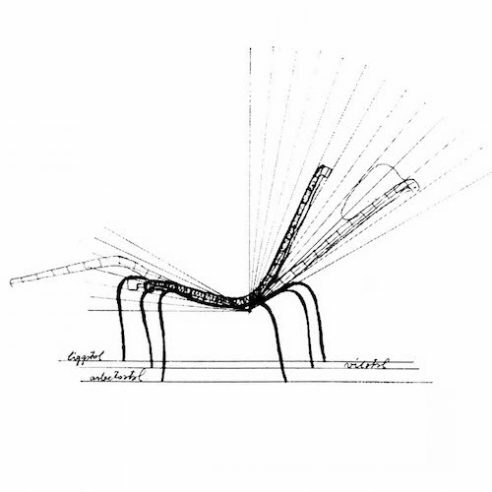 He had carried out numerous experiments to develop what he had called the “hammock” or the seating form based on a timber frame supporting woven hemp webbing he had used on his 1931 “Grasshopper Chair“. In the spring of 1934 Bruno Mathsson had discovered a newly marketed casein type glue (one based on phosphoproteins) that did not require heat but only the application of pressure to provide a sufficiently strong bond. It was this discovery that led Mathsson to experiment using laminated beech to construct frames strong enough to hold the woven hemp at what ever angle he judged necessary to provide good ergomomic support. This was the innovation that led to the development of the three basic chairs exhibited at the Röhsska Museum.